X File Explorer (XFE) is an extremely lightweight and minimal file manager. I was forced to look for such a file manager when I found both Nautilus and Nemo struggling to open directories containing thousands of files. XFE is blazing fast and consumes extremely small amount of memory. 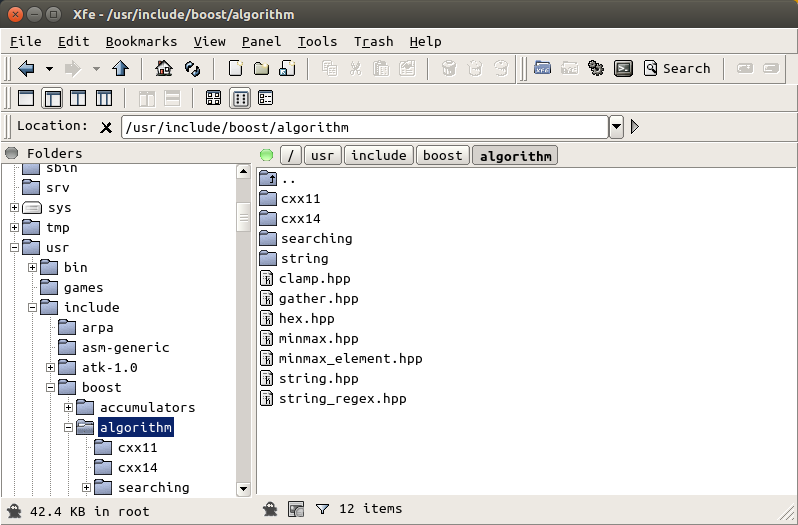 It is written in the minimal FOX Toolkit and looks the same on any platform. However, this is an old version and does not have many new features. I found it better to download the .deb file of the latest version from here and install it. Directory contents can be displayed in 3 views: big icons, small icons and list. Tree view on the left and up to two panels can be displayed. Bookmarks are rudimentary, but available. Settings are stored in ~/.config/xfe/xferc. In small icons display mode, only the first 20 characters of filenames are displayed by default. To change this to display full filename, right-click anywhere and choose Autosize. One of the main problems I face with XFE is that it is quite flaky. I find that the window just disappears while it is being redrawn or flickers under XFCE.